"I thought the best homage I could give to a figure as significant as Duma Nokwe was a portrait. It's also a way of diminishing the ego of the sculptor," says Lewis Levin, who decided to use his signature medium, the light-filtering screen, to create Nokwe's portrait. The idea was "almost to produce a photographic image that is a ghost. When we die we become ghosts. A ghost is a beautiful name for an invisible person... We live among ghosts." Levin says he looked at a photograph of Nokwe and was moved by the white of his eyes, the light on his forehead, his open mouth, his quiet dignity - "all of those things spoke to me". The base of the portrait would serve as a doorway, what Levin refers to as "the door that Nokwe couldn't go through physically". Levin thought about interpreting Nokwe's photograph as a series of dots, stripping away as much information as possible from the picture, "so it filters the light, becomes a screen, and, at the same time, a portrait, an urban image". He reconfigured the image on the computer, before cutting the plate, which is a pixellated version of the negative. "The negative reverses light and dark, so that the light coming through creates the image, making a photograph out of steel," he says. About two metres tall, the artwork is a flat metal structure incorporating the image of Duma Nokwe's face using laser-cut holes in metal. 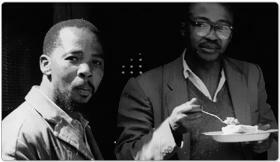 Installed outside the Johannesburg High Court on Pritchard Street, it immediately attracted attention from passers-by. Levin says it was very moving to visit the memorial with Advocate George Bizos, Nokwe's widow and other members of his family. "It was like they were at a doorway, moving back into history. The occasion became like an unveiling, and the artwork does have the proportions of a memorial stone," he said.